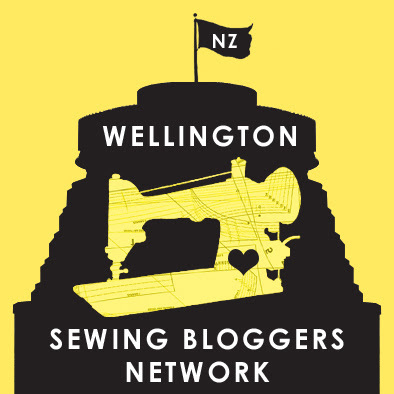 So three months ago, Leimomi from The Dreamstress came up with a challenge for the Wellington Sewing Bloggers Network: as we all shop at the same fabric stores, and often have the same patterns, could we make a chain of fabric and pattern links that spanned those of us who wished to participate? The short answer is yes, but it took some serious organisational skills to get us there! The plan was that each of us would share a fabric with someone, and a pattern with someone else, who would share a fabric with another person, who would make the same pattern as the next person…Leimomi does a much better job of explaining this than I do! My link is my silk chiffon Alder dress. I jumped the gun when I posted it two weeks early! I share a fabric link with Sandra over at Sewist Stitch, who posted her gorgeous Sewaholic Granville shirt yesterday, and Zara will be blogging about her version of the Alder dress on Monday. It was a really interesting exercise to be part of, I find it fascinating seeing all the different ways patterns can be interpreted, and how different they can look in different fabrics! Best of all, this challenge finally got me to a WSBN social function. We met for Yum Char then had photos at Te Papa (our national museum). It was lovely to finally meet some local bloggers in real life! If you’re interested to see the rest of the chain, pop over to The Dreamstress, where Leimomi is linking to a different blog each weekday.